This is very small attempt of bringing together the Indological Research Institutes and vedapathasala-s in India and their activities in one book. 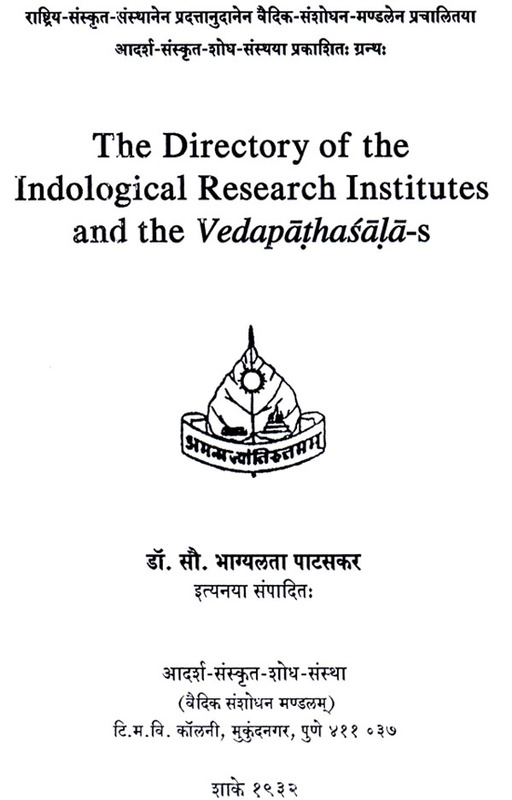 I know that this attempt is not exhaustive, rather this is the request to the scholars to give us more and more information about the Indological Research Institutes and of the vedapiuhasala-s, they know in their area and or elsewhere. We sincerely admit that despite of our continuous efforts for more than one year we could not collect much information of the Institutes and of the vedapathasala-e. To both the Research Institute and to the Pathasalii-s we have circulated a small form. A few more we got from the internet. About the Indological Research Institutes. There are more than 100 Indological Research Institutes fully functioning today, obviously more than that are existing but not fully functioning. By fully functioning I mean, there is a paid staff, who is working on certain projects. The courses of different duration are being carried over, and accordingly such institutes are also engaged in teaching, training, examination schedules, conducting courses, syllabus, students, teachers and lectures etc. etc. Research activity IS finally supported by such teaching, preaching and training activities. The main aim of these research institutes is to work on certain topic and as fruit of it, they bring out a book. Thus number of publication of the books is the norm to measure the progress achieved by these institutions. However it seems that nowadays the trend, direction and method of the researches is bit changed. It is shifted from library to society. The researchers are motivated to make it useful for the mankind. Normally this is found in case of yoga institutes (based on experiments and statistical data.). However the major research projects of these institutions can be classified as follows- A. Preparing the critical editions. B. Giving the translation and notes. C. Preparing vanous indices, concordances, dictionaries etc. Collection of the manuscripts and their digitization are additional activities undertaken by the research institutes. The 14 Sanskrit Universities play very important role in this field. On one hand they promote Sanskrit studies, utilize the expertise of these Institutes and on the other hand yield and provide trained and capable staff for them. After going through this data I really felt a need of strong network of these institutes. Let us hope that our attempt would yield such fruit. Collective information of the vedapiuhasala-s as well as of the Gurukulas is also long felt desideratum. 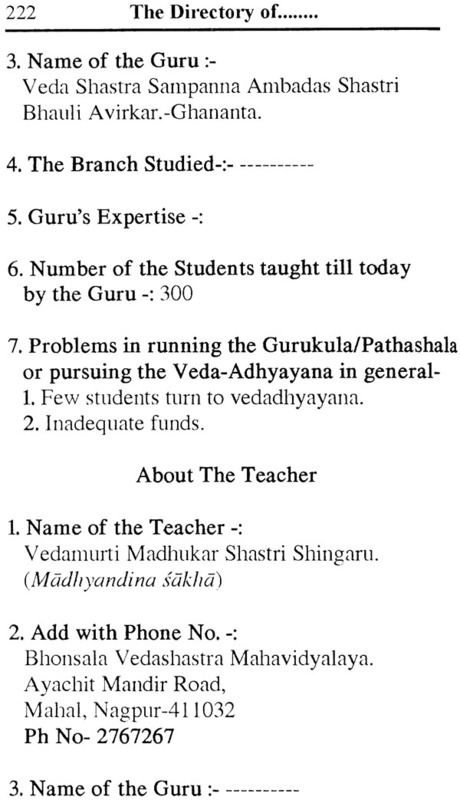 It is essential to know which vedasakha-s are being taught. What are the practical difficulties in expanding this activity so to contribute to the preservation of the vedic tradition. The Maharshi Sandipani Rashtriya Vedavidya Pratishthan, Ujjain (An autonomous organization of Ministry of HRD, Govt of India) has been doing a note worty work regarding the preservation of the vedic tradition. We have also given just a list of the pathasala-s which are included in the either of schemes of the MSRVVP. We mention this with deep sense of gratitude. A certainly note worthy attempt is found with Maharshi Veda Vyasa Pratishthan, Pune. It is the visionary efforts of Swami Govindadeva Giri (former Acharya Kishorji Vyas. 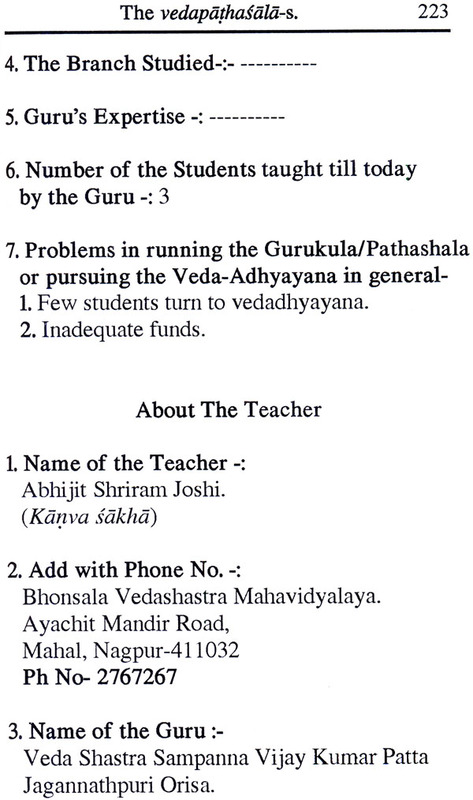 ), that has turn into form of this pratishthan. With the inspiration and blessings of Swamiji, a good number of Pathasala-« have been established in several parts of India. Vedamurti Nana kale from kasarwadi (Barshi, Dist-Solapur) has also put serious efforts for the revival of the branches which were certainly at the verge of extinction. We hope this survey would certainly serve the cause of the promotion and stability of the vedic tradition. A cursory glance on the information collected from the Pathasala-S will reveal. the fact that the major problem they are facing is the want of good, capable, enthusiastic and promising students and also good, dedicated residential teacher. The financial problem can be overcomed. Even a place, food can be provided but different types of efforts, with different direction are required to attract good students towards and to retainthem in the field. One more fact revealed through this survey is that there are geographical pockets where the pathasala-s are comparatively good in number. Contrary to that there are some places where this activity is very rarely found. 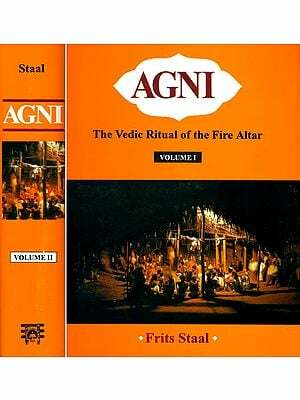 Many institutions and organizations have seriously undertaken the promotion and prapagation of vedic tradition. They may take serious note of this point. At the end of this note we express our deep sense of gratitude towards all of them who extended their cooperation by responding to our appeal. Very sincerely I thank Ms Aditi Pandit, who did a ground work for this project. With her tireless efforts in pursuing the information only, we could do it. It is Aditi who has solely done DTP and page- setting of this book. Thanks to Aditi once again. Ms Vaijanti Dhole Patil and Ms Surekha Wagle of Step in Services also deserve our thanks for speedy and perfect printing. We take this opportanity to acknowledge the support extended by the authorities of the Rashtriya Sanskrit Samsthana, New Delhi, who has funded the entire scheme of the Adarsha Sanskrit Shodha Samstha.